So what happens when a successful IT-executive owner takes up on ad for an assistant that is required to help him narrow down the search for his "ideal wife"? You would think an attractive and powerful man wouldn't need to take up an ad to help him but as it turns out Blake Donovan needed Andrea Dawson to play matchmaker. So begins the hunt for the perfect wife? "He never tell her the real truth-that she intrigued him and beguiled him and he couldn't imagine letting her walk out the door, never to be seen again." 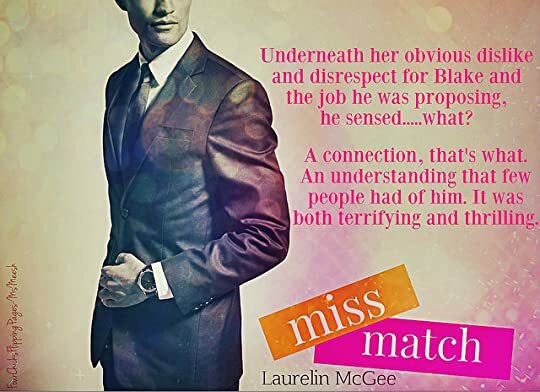 Miss Match by Laurelin McGee was a witty, entertaining, and funny read filled with lots of banter, passion, and a quirky romantic-comedy tale of finding the right match in today's modern world of dating. Blake Donovan is not your everyday millionaire bachelor, he's attractive and successful but he's also arrogant, pompous, and domineering. When Blake tells Andrea Dawson what his requirements are for in a wife, he listed out to her that he's looking for someone that is quiet, attractive, and who will be satisfied being a homemaker to fulfill his needs and wants. Basically, he is in search of a submissive wife and Miss Matchmaker, Andrea will help him find the one. So can Andrea find his match? Or will she finding herself to be the perfect match for Blake Donovan? I did enjoy this book though I might say that I loved Andrea's character more than Blake's. Personally, I thought the authors did an excellent job showcasing how strong, funny, and charming Andrea is but felt Blake's character needed to be explored more especially with his past. I think if the authors allowed readers to understand Blake's past and why he acts the way he does, will allow readers to see more sides to his character. But overall, I thought the authors did a great job intertwining humor, sexual tension, banter and romance into this book. So if you are looking for a fun romantic comedy read, then Miss Match might be for you.